There weren’t many times I cried at school, I usually saved my angsty tears for behind my bedroom door, but I clearly remember crying when made to read a section of ‘The Call of the Wild’ in an English class. I was twelve, and glad I had glasses to hide behind. It was only a few pages for us to take apart, concerning the voyage Buck takes after being stolen, beaten with a club, then shipped up north to pull sleds for those lured by the gold rush. And it ended round about the time a kind, friend that the central dog Buck makes, a girl dog called Curly, is ripped apart by other dogs at a freezing snowy camp, for just trying to make friends with them. I swore then I’d never read the whole book. However, it’s turned up on the 100 Greatest Novels list, so I have to. I bought it months ago and have been ignoring it, but yesterday afternoon I forced myself to read it. I have no idea what possesses a person to write a book where sweet natured dogs get clubbed and whipped regularly. Sure, it technically has a happy ending, it’s informative, has interesting characters, and like Buck’s evolution into a harder dog that doesn’t feel pain in the same way, we as readers become more used to reading the beatings he takes, but I needed tissues (and therapy) by the end. I didn’t cry as much as I did with ‘War Horse’ and ‘Watership Down’, but it was still thoroughly unpleasant. At least I read it at home. I made the horrible mistake some years ago of being at work when I finished Anne Frank’s diary, having no idea that its abrupt end would see me quietly howling in the toilets, and have to keep flushing the toilet to drown out the sound of my sobs. Now I realise colleagues must have suspected I’d blocked it up, which is worse! To conclude, I am now looking for something cheerful to read. My recent reading has involved starving mill workers, African slaves, Siberian gulags, and now cruelly-treated dogs. I’ve also had ‘Three Men in a Boat’ for a while, and will now start that, as judging by a quick flick through, the dog appears to be having a swell time. ← Cleaning Is Always Easier If You Get Paid In Notebooks. Dogs don’t usually have much luck in the classics do they? I just read a collection of 5 Russian dogs stories and their lives wee not happy…. 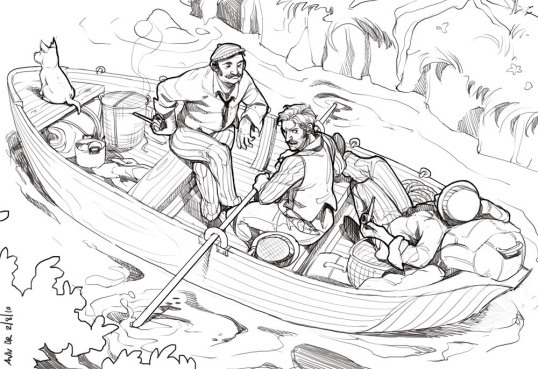 But Three Men in a Boat is quite wonderful and usually has me laughing out loud so I hope it cheers you up! No – there’s plenty of doom and gloom…. I haven’t read this but I have it in my possession, in one of my towers of books. It’s a lovely old edition from 1903. Ooooh. After gulags, slave ships, and beaten dogs, I recommend “Hitchhiker’s Guide to the Galaxy.” You need a break!!! Hello 🙂 That sounds heartbreaking! I’m going to treat that as a warning, and avoid that book 😦 Happy books for a little while I think!